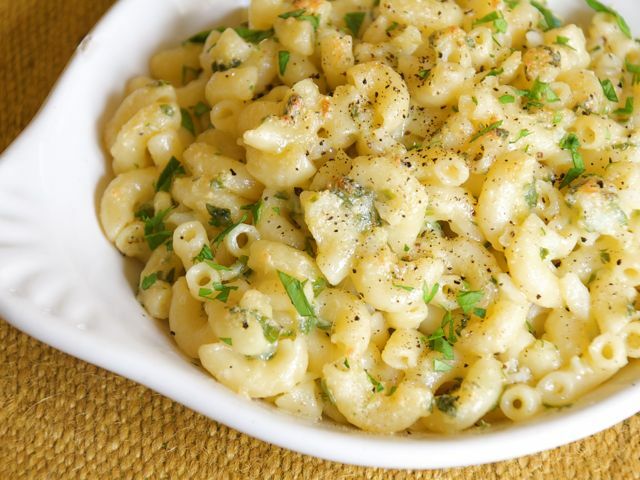 You can either serve this macaroni unbaked, so it’s loose, gooey, and silky, or bake it under the broiler for a few minutes before serving to give it a crispy, golden topping. You could even try adding a grated hard-boiled egg or cooked prawns, but I like the simple style, as here. To prepare the cauliflower: Remove the outer green leaves from the cauliflower and discard. Slice the end off the cauliflower stalk and cut the head into small florets. Halve the thick stalk lengthways, then slice thinly. Grate the Cheddar and Parmesan into a large heatproof bowl. Finely chop the parsley stalks and leaves. To cook your pasta: Bring a large pan of salted water to a boil. Add the macaroni and all your cauliflower and cook according to the macaroni-package instructions. Place the bowl of cheese over the saucepan and add the crème fraîche. Carefully stir every so often until the cheese is smooth and melted. If the water boils up beneath the bowl, just turn the heat down slightly. Add all the chopped parsley to the melted cheese and season with a pinch of salt and pepper. Carefully remove the bowl of cheese using a towel or oven gloves and put aside. Drain the macaroni in a colander over a bowl, reserving the cooking water. Return the pasta to the pan, pour in the melted cheese, and stir. It should have a lovely, silky consistency, but if it’s too thick for you, add a splash of your cooking water to thin it out a bit. At this point you can either serve the macaroni as is, or finish it under the broiler to make it crispy and golden on top. To do this, preheat your broiler to a medium to high heat. Add ⅔ cup of the reserved cooking water to the macaroni, stir in, then transfer to a baking dish. Place under the broiler until golden and bubbling.